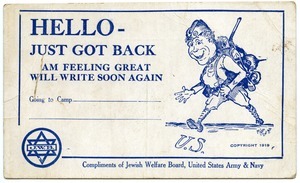 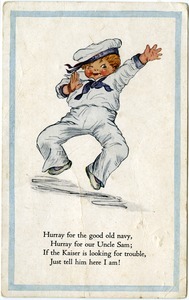 Pre-printed return card with cartoon image of doughboy with German helmets as souvenirs, greeted home by a dog with wagging tail. 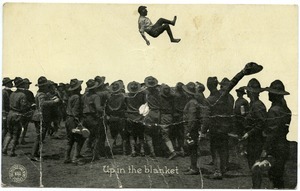 Chicago (Ill.) - American troops in a blanket toss. 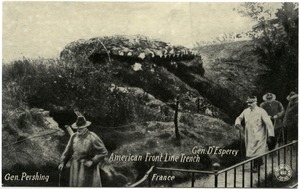 Chicago (Ill.) - Generals Pershing and D'Esperey walking by front line trenches. 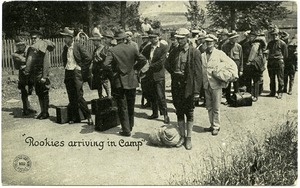 Chicago (Ill.) - New recruits to the American army reporting for duty with bags in tow. 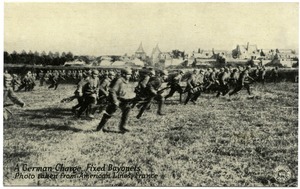 Chicago (Ill.) - Line of German soldiers charging American positions. 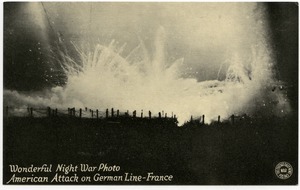 Chicago (Ill.) - Night bombardment at the front. 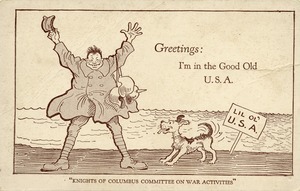 Pre-printed arrival card with cartoon image of doughboy come home with German helmet as souvenirs, greeted home by a dog with wagging tail. 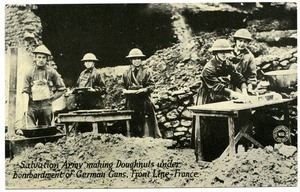 Chicago (Ill.) - Salvation Army field station in the trenches, offering doughnuts and other refreshments. 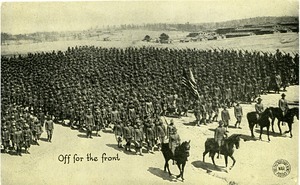 Chicago (Ill.) - Large column of American troops parading off to the front.